When it comes to travel, almost half of all Kiwis spend more than 10 percent of their annual income on holidays, making the most of each trip by prioritising their time and pre-booking adventures. New research commissioned by Visa looks at the travel habits of New Zealanders and Australians, noting differences and similarities between the trans-Tasman counterparts when it comes to researching, booking and taking holidays. In New Zealand, 85 percent of Kiwis choose to book the majority, if not all, of their holiday activities before heading away, compared with 88 percent of all Australian travellers. The market is flooded with smartphone apps that help air travellers navigate their journey, from checking in to receiving updates when a flight is delayed. But by the end of 2012, these apps may not be necessary. 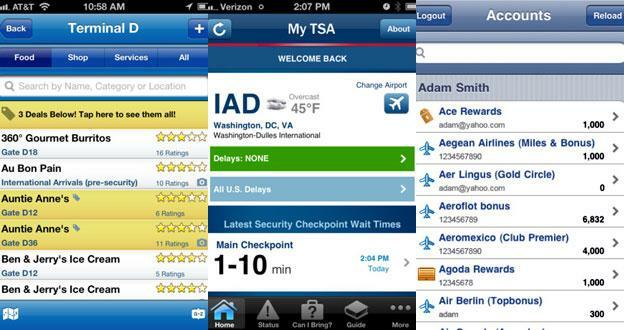 Apple’s new operating system, iOS 6 (a free update for most recent versions of the iPhone and iPad), will include a built-in app called Passbook that will function like many air travel apps combined. 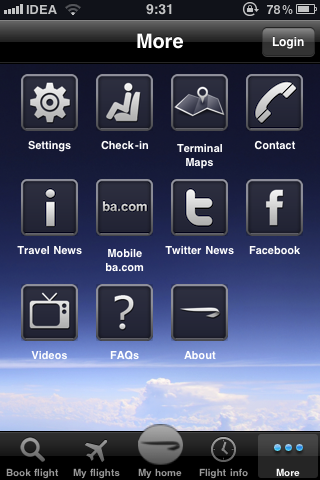 Using your various frequent flier accounts, Passbook will store the information about your upcoming flights. On the day of your flight, the app will use your device’s geolocation service to recognise when you’ve arrived at the airport and open the relevant boarding pass, complete with a barcode for the gate agent to scan. 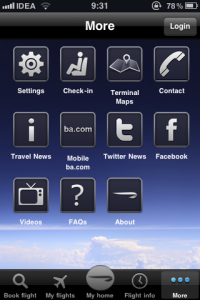 Passbook will also provide gate status updates and include a hotel-booking tool. Android, the largest rival smartphone platform to Apple, doesn’t yet have a similar service for its devices. So for travellers with Androids, or for those of us who prefer to stock our phones with several apps, here are a few that specialise in making the air travel experience run smoothly, with functions that will remain useful even after Apple’s new Passbook app debuts. For detailed forecasts, iPhone users should give the WeatherBug app a try. When it comes to weather apps, hype springs eternal. Many promise to deliver weather reports relevant to a smartphone user’s precise location, but the advertised “refresh” doesn’t always mean a new forecast. Others claim to have easy-to-read interfaces, enabling users to make travel plans at a glance – but don’t. In reality, the most popular apps perform a few functions well — not all of them. And the quality of weather apps seems to range greatly by region. For example, Canada’s local leader in weather data, The Weather Network, provides forecasted snow accumulations on its free iPhone and Android apps, something that neither the Weather Channel nor AccuWeather do for their United States apps. North American-centric apps also tend to lack access to the nitty-gritty data gathered by the official meteorology organisations in foreign countries. Australia’s Android Pocket Weather AU uses Bureau of Meteorology data, including (so-far-unique) access to the official agency’s detailed rain radar (about $2, Android, iPhone). Similarly, Britain’s new Metropolitan Weather Service app (free, Android, iPhone) delivers much more precise rain forecasts than its US-centric rivals. Bottom line: if precision matters, download the app from the official weather service at your destination, where available. But if your holiday plans are still unclear, here are the apps most likely to appeal to a global traveller who decides itineraries on the fly. All of these apps offer optional alerts for major weather events, such as approaching rainstorms. Droids come with “widgets”, mini-apps on the home screen that constantly refresh themselves without needing to be activated. Travellers should swap out the pre-installed weather widget with the AccuWeather one, which comes free with its app. AccuWeather’s widget and app deliver temperature and condition forecasts for locations worldwide, updated hourly. AccuWeather taps into your device’s GPS locator tool and enables you to see a forecast for your precise spot on a map, without having to know your location’s name or spelling. That is a practical feature for travellers off the grid in a rural area or moving rapidly through the countryside on a train. The app also makes it easy to track forecasts for a few destinations at once and has far fewer flashing ads than other free apps, at least as of today. The latest generation iPhones come pre-installed with Siri, a voice-activated personal assistant that can be asked about the weather (such as “What is the forecast for the week ahead?”). But the result is generally vague, such as “sunny and 76 today, cloudy and 75 tomorrow”. For detailed forecasts, iPhone users should give the WeatherBug app (free, iPhone) a try. It has far fewer flashing banner ads than rival apps and an easier to read interface on the iPhone, providing hourly predictions for the coming day and a 10-day forecast with minimal detail for rapid scrolling. A menu-and-swipe interface makes it easy to drill down for details. One drawback is, unlike the Weather Channel and AccuWeather apps for iPhone, WeatherBug lacks the ability to find a forecast for any geo-location internationally, directing you instead to the forecast for the nearest urban centre or airport. But the app does allow you to track more than one destination at a time. 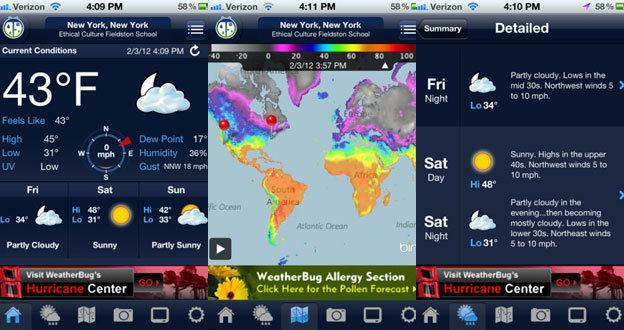 Apple picked the Weather Channel app as its first iPad-available weather app for good reason. No other app takes as full advantage of the tablet’s large, interactive, high-resolution screen. Radar maps are animated to let you suss out a storm’s direction. Touch any point on a spinning globe to see the weather at that spot. Plus, no company is as good at video reports of weather forecasts as the Weather Channel, and its videos appear beautifully on the iPad’s large screen. The app’s TruPoint technology, similar to AccuWeather, uses the iPad’s built-in GPS locator for assessments of weather conditions within a mile of any arbitrary location, without you needing to enter your location’s name. 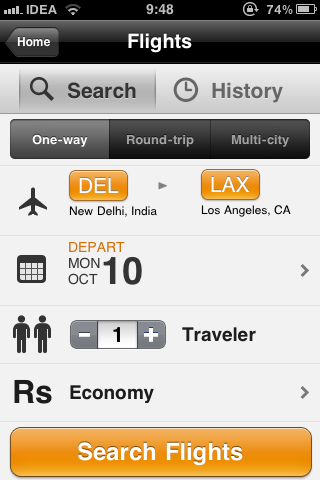 The app also makes it easy to track forecasts for a multiple destinations at the same time. From left, Expensify, Concur and XpenseTracker. Sometimes it’s not jet lag or missed connections that thwart business travellers – it’s filling out those tedious expense reports. Thankfully, a few smart phone apps are lessening the ordeal. 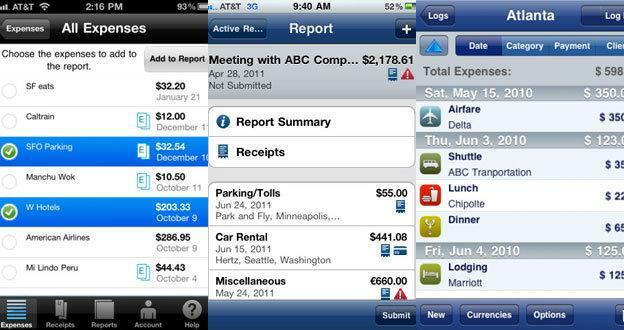 The three apps most often recommended for tracking expenses are Concur, Expensify and XpenseTracker. These apps allow you to automatically import bank account and credit card transactions into an easy-to-use expense report that meets IRS requirements. They make it a cinch to snap photos of your receipts, categorise them (such as by “entertainment” or “lodging”) and attach the images to a report, which can be edited later via the apps’ websites. The apps also produce files that are compatible with many small businesses’ accounting systems, such as QuickBooks. Lastly, the apps allow you to enter transactions in a variety of currencies and produce reports in a variety of formats, such as spreadsheets that you can import into software like Excel. Each of the apps differ slightly from the others, so though they’re all highly rated and frequently downloaded, one may work best for you. Concur is the largest North American company in the travel-and-expense management business, and its tracking products are used by more than 15,000 corporations. This app may be best for anyone employed by a large company because its data has the greatest likelihood of being seamlessly compatible with their company’s expense-reporting system. Free for the basic version on Android, iPhone/iPad and Blackberry. Expensify is an innovative, two-year-old app that has been downloaded more than 300,000 times and has high ratings from its users, many of whom seem to be freelancers and entrepreneurs. It’s my personal favourite for its irreverent touches; for instance, its “submit report” button is named “telepathy activate!” Silliness aside, the app does an accurate, automatic job of reading the receipts you’ve uploaded, pairing expenditures with individual items listed in your online bank and credit card statements, and categorising your expenses. Free for the basic version on Android, iPhone/iPad and Blackberry. XpenseTracker has an elegant design and clean user interface, making it extremely intuitive and quick to record mileage travelled and other details on the fly. Many experienced travellers sing its praises, including Pauline Frommer, the globetrotting creator of the award-winning guidebook series, who says she uses it “religiously”. The app stands out for producing sophisticated, PDF-formatted expense reports that are well-enough designed to make you look like a pro when you submit them to clients. (The reports of the other two apps mentioned above are less impressive when printed out and seem mainly useful for copying the information and re-entering it into an employer’s or client’s own forms.) One downside: XpenseTracker currently only works with Apple devices ($5 for iPhone/iPad). In the past year, a handful of free websites have debuted with features that up the ante on standard internet mapping tools like Google Maps and Mapquest. Instead of providing turn-by-turn directions, these new sites (all of which are mashups of Google Maps) allow for navigation based on the type of transportation you’re taking, the time you’ve been given to explore, the sites you’re looking to discover or the memories you’ve made. 4SQoogle maps the most recent online check-ins from location-based mobile service Foursquare. The site doesn’t reveal the names of those who checked-in somewhere, but 4SQoogle proves its worth as a tool for discovering the city’s hottest venues, noting both “live” check-ins and total check-ins over time. During a recent lunch hour, London’s most popular spot among Foursquare users was surprisingly around the House of Commons. Later at night, West End venues were (not surprisingly) buzzing, with bar and restaurant the Living Room scoring the most Foursquare visits of any hangout. Mapnificient.net reveals areas you can reach by public transport within a certain time. Say you’re staying at a hotel in Madrid and want to know where you could go for dinner within a 30-minute metro or bus ride. 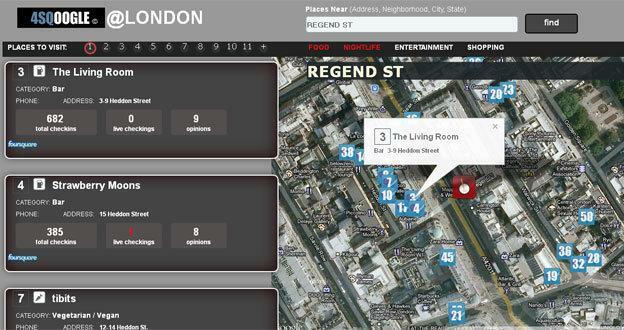 Drag the online marker to your hotel’s approximate location and set a slider to 30 minutes. A shadow map will then reveal the area you can easily cover by public transport within a half hour. The site works for most major US cities and for many other cities worldwide, such as Canberra and Madrid. Isochronous Application is to driving what Mapnificent is to public transport. Pick any urban area in the world, specify a maximum amount of time you’re willing to drive (or to ride in a taxi), and the site will predict how much ground you can cover during that time — assuming no traffic congestion or other hindrances. In a three-hour drive from London, for example, you could see a large swath from Nottingham to Dover. Uencounter.me enables you to create a custom map of the world that you can annotate with personal notes of what you did at each place. Click on your virtual pins to reveal the notes detailing what happened at each spot, such as the time and location you visited it, what the activity was and who you were with at the time. You then have the option to share and overlay your “memory map” with those of friends and family members. You can email the map to others, too. GuidebookPlus makes it easier to plan a daily itinerary with the help of major guidebooks, such as those published by Lonely Planet and Rough Guides. If you’re staying at a hotel in Benin and you want to see if there are any nearby attractions, GuidebookPlus can zoom in on a map of the area and display nearby virtual pushpins, each referring to a tourist attraction and with the relevant guidebook page number that describes the attraction. Then, you can use Internet searches or Google Books to possibly access the guidebook text for free. This article is written by Adish Jain, who is a geek, gamer and travel and music enthusiast. Who says booking air tickets and keeping an eye on the flight status can only be done by sitting in from of a PC with an internet connection? Those were in the pre-application era where the world was restricted to a big monitor. Today, applications have changed the way we live by pushing all this and more, to the small display on our smartphones. Listed below are a few apps that will let you book flight tickets and track real time flight status from anywhere, anytime. Kayak: Booking flights has never been so simple. 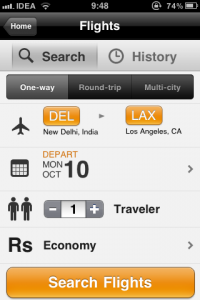 This app has an intuitive interface that lets you choose from round-trip, one-way or multi-city. Capable of automatically detecting the location and the nearest airport, it allows you to choose the destination by typing the city’s name. It works well with domestic as well as international locations and is just like an online web portal where you can select your preferences – exact date, flight cabin (economy, premium, business, first), non-stop journey and number of passengers. The search lists various flights along with the travel fair, airline, departure and arrival time. And while viewing details, you can always book the flight simply by calling the listed vendor. (Available for iOS, Android, Symbian, BlackBerry and Windows Phone). Skyscanner: As the name suggests, this app dedicatedly searches through the numerous flights and comes up with the cheapest options available. 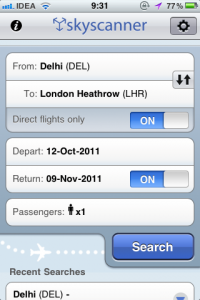 The neat layout allows users to select the departure city and arrival city from the drop down menu along with the date. There is one touch option to select the return as well as the non-stop flight. This quickly comes up with plenty of flight details along with the air-fair in Indian currency. The search can be sorted using airline, duration, and landing as well as take off signages. It does store the latest search history and lets you share the information over email. (Available for iOS and Android). MakemyTrip: This is one name you will be familiar with. 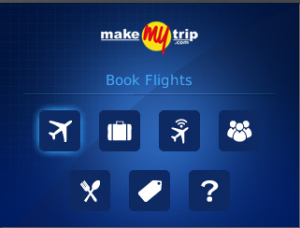 Coming from makemytrip.com, this application is available only for BlackBerry smartphone owners. Similar to the web interface, it performs various tasks smoothly, from booking flights on the move to cancel tickets, get e-tickets and track refund. 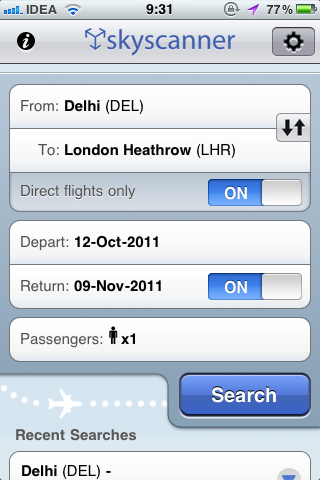 Checking flight status is also enabled on this application. While using the app, you can search for the latest travel deals along with the nearby places to eat. (Available for BlackBerry OS). Flight Aware: We don’t just always end up booking flights but tend to keep an eye on the departure-arrival time when someone known is travelling. 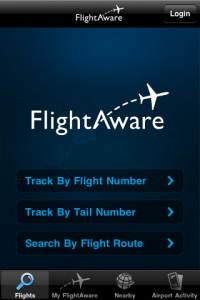 The FlightAware app is designed for such a situation. 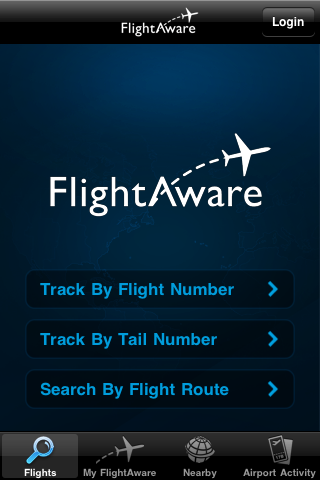 It lets you track the flight using your flight number and tail number. In case, you have none, you can always search through origin and destination. Regular travellers can save preferences including my aircraft, my airport, etc. Using the current location, you can view the nearby aircrafts flying and mobile push notifications which would give details such as estimated departure time, departure and arrival notices and gate/terminal assigned. (Available for iOS, Android, BlackBerry and Windows Phone). Airline Applications: Catching up with this trend, some of the leading airlines too have come up with their very own mobile applications. This includes American Airlines, Air France, Lufthansa, British Airways, AirAsia, Singapore Airlines and Fly Delta to name a few. These are available on download from the respective applications stores. Most of these are available for Apple iPhone and Android smartphnes but a few of them are also compatible with the BlackBerry and Symbian operating systems.